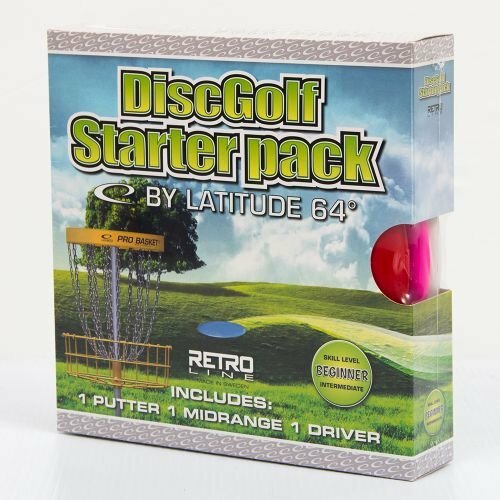 The Junior Retro Disc Golf Starter Set from Latitude 64 comes with everything a new disc golfer needs to play disc golf - a putter, a midrange, and a driver. Inside you will find three of the easy to use line discs from Latitude 64. Discs Included: Latitude 64 Retro Diamond (Driver). Latitude 64 Retro Pearl (Midrange). Latitude 64 Retro Ruby (Putter). Disc weights and colors will vary. The discs in this starter set will weigh between 145-159g. Disc colors and weights may vary. If you have any questions about this product by Latitude 64, contact us by completing and submitting the form below. If you are looking for a specif part number, please include it with your message.